Lots of people wonder if the Bible is truly the Word of God. I remember sitting in my first theology class during my first year in Bible College and the professor, Dr. Mayer, told us that the Bible is the Word of God. I had always believed and accepted this, and was excited to get some proof for the idea. 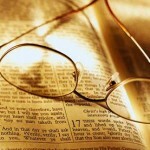 The proof consisted of several Bible verses which speaks of Scripture as being the Word of God. Later, in Seminary, I was given a slightly more involved defense for the Bible as the Word of God. I will lay it out for you below exactly as it was given to me. I am curious if you think it is convincing or not. One facet of being a person is to attempt to communicate something of oneself with some other persons, if one is able. God is a person (from the ontological argument). God is able to communicate (from His omnipotence). God only communicates truth (from the ontological argument). There has been a sufficient amount of time to give God the opportunity to communicate to some people. Therefore, God has communicated with some people. The Old Testament (OT) and New Testament (NT) consistently claim to be from this kind of God. The Quran contradicts the OT and NT but claims that all these are divine revelation, so it must be rejected as contradictory. The Book of Mormon contradicts the OT and NT but claims that all three are divine revelation, so it must be rejected as contradictory. The Apocrypha, Vedas, Upanishads, and other religious literature do not claim to be from this kind of God. Therefore, God has communicated truthfully the whole Bible (OT and NT), whereas no other religious literature can legitimately claim to be of divine origin. There are other arguments for the Bible as Divine revelation, such as fulfilled prophecy, and the Bible being written over thousands of years by dozens of authors, and not containing contradictions, and numerous other arguments. I am just not sure any of these arguments are persuasive for anybody but Christians. Frankly, I am not too sure that anybody really cares except for Christians. What do you think? Would the arguments above persuade you that the Bible is Divine Revelation? Do you think that such arguments are helpful? None of this convinces me that the Bible is Divine Revelation. I believe God is who He claims to be and Jesus is who He claims to be because I have chosen to do so. Some call this a “leap of faith”. I encounter God almost daily – sometimes as I read Scripture, and often in encounters with people, as I’ve been writing about on your (Jeremy’s) blog at Graceground.com in the “Getting To Know Your Neighbors” series, and in the current “Being The Church in the Communioty” series. I connect with God through other people. My faith does not require the high degree of perfection that some claim for Scripture. If it is straight from the mouth of God, that works for me. But I read it much more as a record of real people’s experiences and subsequent encounters with God. My experience with people that I have personally known has ALWAYS been that those who demand that the Bible be the highest level of divine revelation, the very word of God, sometimes literally from the mouth of God, are quick to point out where their Bible (usually their English translation, but not always) proves X. Here X is their list of favorite doctrines, which usually “prove” things such as their wife should obey them, one “must go to church and give money to it”, only their brand of church understands the Bible correctly, God hates LGBTs, etc., etc. If all those things are so self-evident, then won’t that be obvious and “provable” from other sources as well? Oh yes, if all those things are so self-evident, then what about all the other stuff in the Bible they ignore? Is that somehow in the part that is not Divine Revelation? Which part is which? Sam, I think you are going to like my series on inspiration of Scripture that I am starting today. I’m a bit nervous about it (primarily because I don’t really know where I’m headed with it yet). I think it is the doctrine of Inspiration that leads many people to read and use the Bible in the way you describe above. Fulfilled prophecy is certainly something that sets the Bible apart from many other books of religious writings. 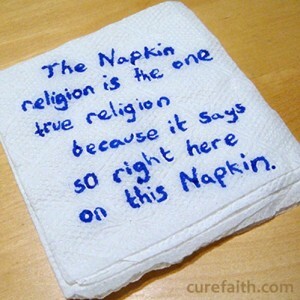 It also is one of the reasons I believe the Bible has divine origins. I would love to hear more about your view of the Bible. What is it? Where did it come from? How was it written? What is it good for? I would say that the only really persuasive argument is the inner witness of the Holy Spirit. But of course that is also for Christians only. It does imply that we have to find apologetic arguments in evangelism other than “this is true because the Bible says so”. Interesting. At one point, I would have argued against this view as “subjective experience.” But as I have been learning, much of what I thought was “objective” still is somewhat subjective. Have you talked with Mormons at all? Almost all of them believe that the Book of Mormon is true because they had an inner warming of the heart and mind, an experience from God, which told them it was true. How would the inner witness of the Holy Spirit differ from this? Does it differ? Yes, of course I am being subjective. But then what argument about this isn’t? Perhaps the only difference from the Mormon experience is what kind of spirit it comes from. Here I could bring in your argument about the Book of Mormon contradicting the Bible, so proving that the spirit behind it is lying. But then I would get into hot water from people finding supposed contradictions in the Bible. The ultimate answer can only be “by their fruit you will know them”. I was just checking out the Biblioblog. Way to go! It seems like you have a top ten blog in several categories. Nice! When studying some of this stuff, do you ever want to just throw your hands up and “give up”? I always feel like the more questions I get answered, the more questions I find, which gets overwhelming. Thanks for the encouragement. Yes, I often want to give up. Then at other times I have a hundred ideas in my head which I want to express. For the moment I keep going! Not sure where this will go in the future. The whole translating the scriptures from it’s original language into english is one of the main reasons I doubt the authority of the bible.eg.many spanish words have no english equivallent.so how can there be such a accurate translation from the hebrew which is older than any of the latin languages into such a young language like english? Good point. This is true of Hebrew and Greek as well. This is one reason there are so many translations, becuase translators keep trying to get “as close as possible” to the original meaning. Some people believe that just as God guided the writing of Scripture, He also guides the translation. This is one argument used by those who believe that the King James Version is the only correct translation of the Bible. This is very dangerous and scary idea. This is my thinking. If we’re to say why we think the scriptural Word of God is inspired, we need to start with the personal Word of God in Jesus Christ. The main reason that I believe that this collection of historically contingent documents is the inerrant revelation of God is because I believe Jesus rose from the dead and I have experienced the power of that event: therefore the prophecies weren’t empty promises, the conquest of Israel wasn’t just a powerplay under the masquerade of a divine mission, and the apostles really were guided by the Holy Spirit to expound further on all matters leading to salvation. If the resurrection is the anchor of our faith in Christ, I think it can be our anchor for faith in scripture. Benjamin, that is a FANTASTIC point, and I completely agree with you. Everything we do must be Christ-centered, including our reading and interpreting of Scripture. I will try to bring out that point in a later post. Ha ha – I’m really only ripping off Karl Barth 😉 But it is the main reason I trust scripture, above any other reason. I don’t blog, I’m afraid. I do like to write, but writing takes a lot of energy for me and so I save it for certain projects. This looks like a good discussion. John Hobbin’s reflections on inerrancy are worth checking out on his blog. Well, unfortunately, based on my experience of over two decades in and out of the church, there’s a lot of truth in what you say here. And it puzzles me to no end, and also saddens me a little. As a non-christian, for years, YEARS I wanted to know God and whether the message of the Bible was true or if it was just the writings of ‘holy’ men and their speculations about God, but nobody I ran into could ever give me any good, objective reason for the hope that was within them. Fortunately, I eventually ran into some christians that hooked me up with numerous books on apologetics. For a number of months I studied them, and eventually found compelling evidence that the protestant canon contained the ‘inerrant word of God.’ Without these apologetic topics that you mentioned, there is no way I would have become a christian. Not a chance. It was the only way I knew that I could trust the gospel message was valid/reliable. I’m not sure I’ve met anyone else that had this same experience. I can’t relate very well to those that rely on subjective experiences, no disrespect to them at all, I just don’t understand how they know whether their experiences are valid or not, but then again they are the norm. I was just wired differently. Dave, I’m glad you found something on which to base your faith. I believe there are others who also base their faith on something similar. While I believe that the people who wrote the material we find in the Bible were truthful, I have never based my faith on apologetics, but on personal knowledge that comes from personal relationship. For me that is not a subjective experience. I read a lot of those apologetics books too. But I read them as a Christian. Did you know that Muslims and Mormons and most other religions also have apologetic books? I wonder if you have read any of them. I have, and the arguments they make are fairly persuasive. If a non-Christian happened to read some of these other books instead of Christian apologetics, I think they would probably end up joining one of these other groups.